Since its opening in July 2007, The Eglinton Casino & Card Club has proven to be the premier casino in the west of Ireland.Situated in Eglinton Street, in the heart of Galway City, Ireland, the Club is in an easily accessible location. Membership is free and is open to any member of the public. To become a member, simply pop in to the club with your address details and an official form of photograhic ID such as a driver’s licence or passport. 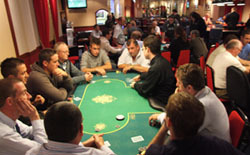 As well as enjoying afternoon and evening Texas Hold’em and Omaha Hold’em Poker tournaments and cash games, members also have access to a full range of house games including Blackjack, Roulette, Oasis Poker, 3 Card Poker and auto gaming. The Eglinton Poker club has set a high standard of poker playing and many club members have gone on to win huge prizes in National and International events. Be sure to bring your best game! Players can also avail of a wide range of snacks in our restaurant along with tea and coffee and complimentary alcoholic beverages while playing. We can be contacted by telephoning 091-569 222 (within Ireland) or +353 91 569 222 for international inquiries. You can contact us via email at info [at] theeglinton [dot] com. Our full address is Eglinton Casino, Eglinton Street, Galway, Ireland. You can also use the contact page to contact us directly.